The detection of new psychoactive substances (NPS) in hair proved to provide insight into their current diffusion among the population and the social characteristics of these synthetic drugs’ users. Therefore, a UHPLC–MS/MS method was developed in order to determine 31 stimulant and psychedelic substituted phenethylamines, and dissociative drugs in hair samples. The method proved to be simple, fast, specific, and sensitive. The absence of matrix interferents, together with excellent repeatability of both retention times and relative abundances of diagnostic transitions, allowed the correct identification of all analytes tested. The method showed optimal linearity in the interval 10–1000 pg/mg, with correlation coefficient values varying between 0.9981 and 0.9997. Quantitation limits ranged from 1.8 pg/mg for 4-methoxyphencyclidine (4-MeO-PCP) up to 35 pg/mg for 6-(2-aminopropyl)benzofuran (6-APB). The method was applied to (i) 23 real samples taken from proven MDMA and ketamine abusers and (ii) 54 real hair samples which had been previously tested negative during regular drug screening in driver’s license recovery. Six samples tested positive for at least one target analyte. Methoxetamine (MXE) was found in three cases (range of concentration 7.7–27 pg/mg); mephedrone (4-MMC) was found in two cases (50–59 pg/mg) while one sample tested positive for methylone at 28 pg/mg. Other positive findings included 4-methylethcathinone (4-MEC), alpha-pyrrolidinovalerophenone (α-PVP), 4-fluoroamphetamine (4-FA), 3,4-methylenedioxypyrovalerone (MDPV), and diphenidine. The present study confirms the increasing diffusion of new designer drugs with enhanced stimulant activity among the target population of poly-abuse consumers. Parts of the work have been presented at the 20th Annual Meeting of the Society of Hair Testing. The online version of this article (doi: 10.1007/s00216-015-9247-4) contains supplementary material, which is available to authorized users. All patients provided written informed consent before donating the sample. Crews B. Synthetic cannabinoids. The challenges of testing for designer drugs. 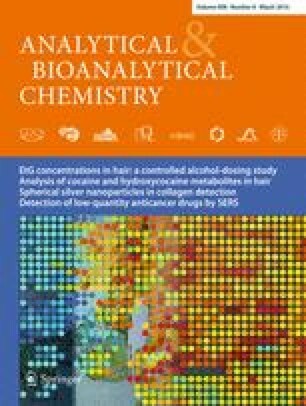 http://www.aacc.org/publications/cln/2013/february/Pages/Cannabinoids.aspx# (2013).